> AliExpress review, is it reliable and how do I buy safe? What is AliExpress and is it reliable? Find out in this AliExpress review! AliExpress is like Ebay worldwide, but a lot bigger. AliExpress has a range of 6,000 different types of groups of products, from electronics to clothes and from toys to jewelry, they have it all. 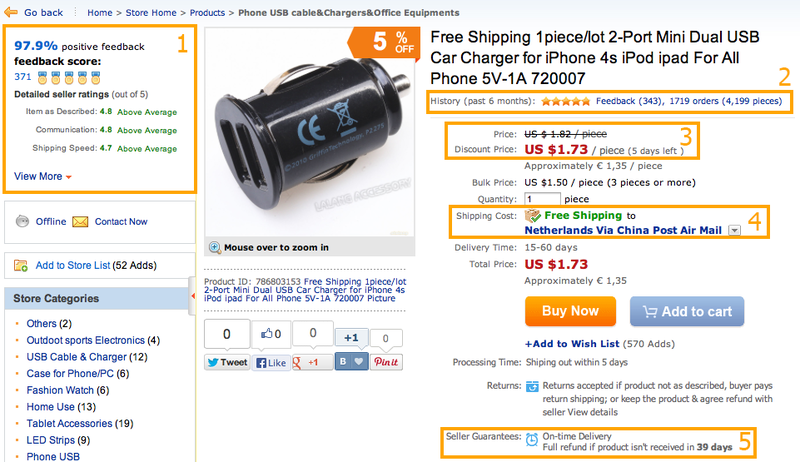 Aliexpress does not sell products, they only offer the possibility to sell your products. Of course this is also disadvantages, later we come back to these disadvantages. Read everything in our Aliexpress review! AliExpress is actually meant for selling bulk products to companies. Bulk (products) are just large quantities of a particular product. So that companies can simply buy an x number of units of the product for a reduced price. The minimum lot size of a product was usually 20 to 50 pieces. Today many sellers offer their products also by one piece. Down below is an example of a seller that offers iPhone USB cables with a minimum lot size of 500 pieces. AliExpress has a very professional and stable website compared with other Chinese online shops. Additionally, AliExpress has released an app for iOS and Android so you can look and buy products wherever you are. This app is also very professional and have a build in chat with sellers so you can ask questions about the products they offer. Just like on Ebay, there are also some sellers on AliExpress who’s their only goal is to scam buyers. But if you buy from the right seller this chance of scamming is very little. AliExpress use the same kind of feedback system as Ebay, so you can see if a seller has already made many satisfied buyers and if they are reliable. Please read the below information in our Aliexpress review very carefully. How do I know if a Aliexpress seller is reliable? 1: Here you can see the percentage of positive feedback that this seller has received in the last 12 months. This percentage basically says nothing as long as you don’t know how many buyers has left their feedback. If you click on it, you see an overview with all the feedback the seller has received in the last 12 months. The last 12 months this seller has 800 positief rating from buyers, so this person is very reliable. 2: This feedback is about the product that is shown. The last 6 months 343 buyers have left their feeback with an average of 5 stars. In addition, the seller had more than 1,700 orders for the product which is good for 4199 pieces total. So that means the quality of this product is very good! These first two points will give you a good idea of ​​the reliability of the seller, here you can confidently place an order. 3: Here you can see the minimum order quantity, in this case that is one piece. If the seller on Aliexpress sells at least 20 units at a time, there will by displayed lot 20 pieces. With the ‘5 days left’ they mean the time that the product is on sale but discount should not take too seriously on Aliexpress and other Chinese online shops! While searching on Aliexpress, you can also specify the minimum order quantity. 4: Some products are offered with free shipping, this is almost every time shipping with China/Hong Kong Post, the package will arrive in 2-3 weeks sometimes it takes a little bit longer. While searching on Aliexpress, you can also specify that you only would like to see products that are offered with free shipping. If you want your order delivered quickly you can choose another shipping agent like UPS or FedEx. 5: If you don’t get the order within 39 days you get a full refund of the order amount. The rest of the productpage is very clear and not difficult to understand, if you scroll down you’ll see another AliExpress product. Thank you for reading our Aliexpress review, if you’d like to search products on AliExpress you can also search the product in the Searching Panda search engine, it knows thousands of AliExpress products!